Their BRX collection expands this year with the addition of a new field bag and a larger messenger bag. I’ve been using the Excursion Field Bag for a couple weeks already and I’m a fan of the layout and usability of this bag. 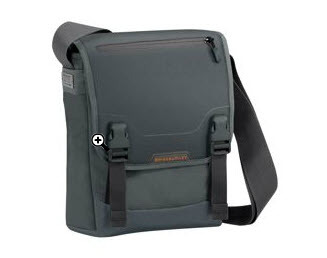 Inside, the back of the bag is designed to protect your iPad, tablet or netbook. A well designed tab lifts your device into the palm of your hand. No more reaching down in the bag trying to get a grip. In front of that slot, there is room for a full size 8-1/2x11 padfolio or even a ½” diameter ring binder. Something as small as a reporter’s or stenographer’s notebook would slide in like butter. Just in front of this area is a deep zippered pocket for computer charger, cords, WiFi access point, hard drives, or whatever else. In the outside access pocket, you’ll find a padded pocket for phone or camera as well as pen/pencil loops and a business card slot, big enough to carry a week’s supply. On the outside flap, there is one more zippered pocket, useful if you don’t want to open the whole bag. This zipper is water-resistant as well, so no more soaking wet plane boarding passes. The flap is held in place with two quick release clips. The strap is long enough for the tallest traveler but adjusts down to accommodate anyone shorter as well. The only thing I would have liked to see in addition to what this great bag already has would be a water bottle pouch on the side of the bag. Lacking that, a carabineer does the job just fine in its place. The BRX Excursion Field Bag will be available this spring online or via their store locator.